Tonight’s dinner was completely made up. It mostly started when I saw we had some almonds. Last week we got a slicer/shredder for our Kitchen Aid stand mixer. It said in it’s manual that you could slice up almonds so I thought I ‘d give it a try. Either it doesn’t work well or I’m doing something wrong, but it came out chopped. There was also a lot of almond dust, so I thought it would make a good breading. So I covered our haddock with flour, gave it an egg wash. 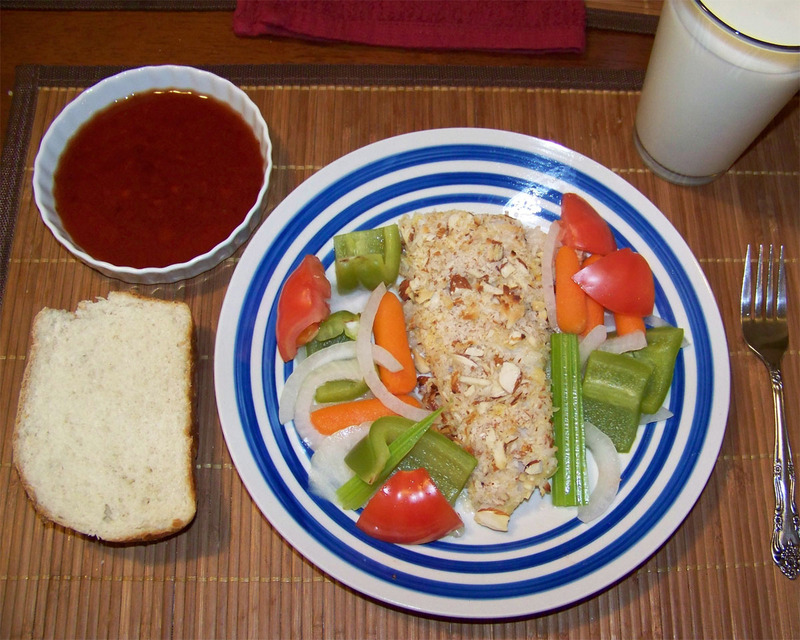 I then covered it with a mixture of almonds, shredded coconut and some panko. I then baked it at 400 until it easily flaked with a fork. This was around the time the coconut started to brown. While the fish was baking I made a sauce with raspberry preserves, Marsala, and brown sugar. I’d also like to point out the bread my girlfriend made earlier in the week; it tasted very good dipped in the sauce. But I do suppose that jam does taste good with toast. Very quick and easy to make. 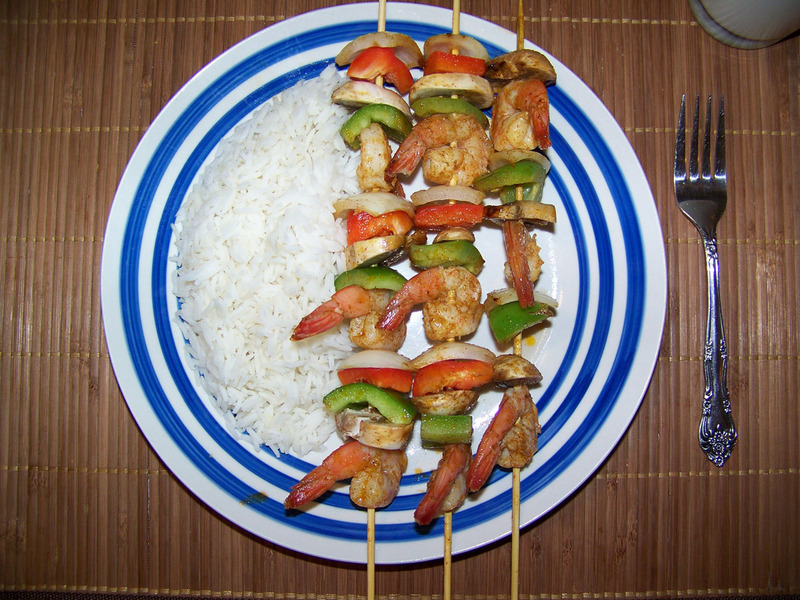 All we did was marinate some cooked shrimp in a reciepe we got from Hannaford’s “fresh Magazine.” We then put the shrimp on bamboo skewers with onions, green peppers, red peppers, and mushrooms. We then steamed the kabob’s in the marinade on a cast iron grill pan. The kabob’s did not make very good contact with the grill pan so that is why I poured the left over marinade on the pan to steam them. Friday night me and my girlfriend made some chicken cordon bleu that turned out very good. I just made up the recipe as we went along. First I butterflied large boneless chicken breasts; I cut them so they opened like books. I then wrapped Swiss cheese in thinly sliced ham, making sure the cheese was completely enclosed to prevent it from leaking out while it cooked. I then shut the cheese wraps in the chicken books (so to speak). 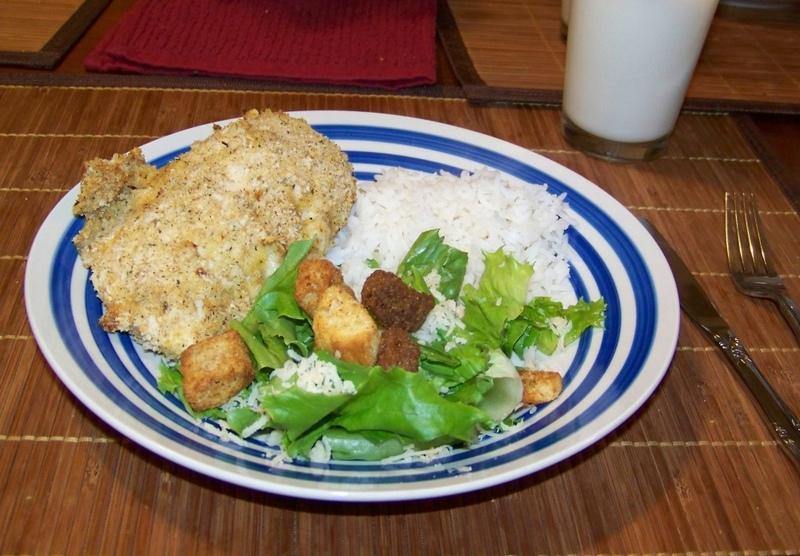 Next I covered the chicken in flour and gave them an egg wash. We then mixed equal parts bread crumbs to panko (Japanese bread crumbs) and added in some Italian spices, ground pepper, and enough olive oil to make the mixture damp. We then covered the chicken in the bread crumb mixture and put them in a 400 degree oven for about 30min (or until the chicken is at about 170 degrees).